Bathe in the light while looking fashionable with this trendy yet simple outdoor chaise. The adjustable back offers personalized comfort and cushions provide hours of relaxation. 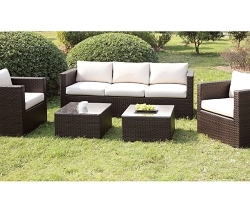 77.75" x 26.75 x 12.5"
UV & Water Resistant, Espresso Wicker Like Frame.